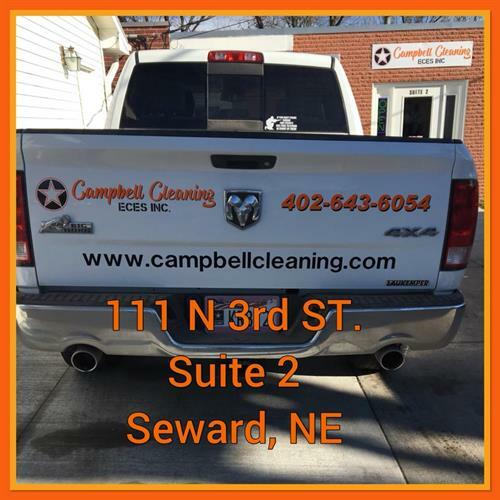 Campbell Cleaning and Restoration was started in 1995 and serves primarily Seward, Saline, and Butler counties, although the company also works in other surrounding rural and metropolitan areas. The company is owned by Duff and Becky Campbell. Campbell Cleaning provides a variety of cleaning and restoration services as well as daily and weekly janitorial service to retail and manufacturing companies, schools, and churches. All Campbell Cleaning tecnicians are IICRC certified to assure quality work and customer satisfaction. Also at the same location is an authorized ORECK store which provides complete sales and service of the ORECK product line of upright and canister vacuums, air purifiers, and home cleaning products. Located just 1 1/2 blocks north of the square at 240 North 5th Street in Seward, the business is open Monday through Friday 8AM to 5PM, as well as Saturdays by appointment. 24 hour emergency service is also available.